In order to better grasp the next chapter of this story, it is necessary to know something about Ramana Maharshi (1880-1950), the Sage of Arunachala, who was made famous in the West by Paul Brunton’s book A Search in Secret India. Ramana had realized the Self at the age of 16, and lived the rest of his life near the sacred hill named Arunachala. Paul Brunton had visited Ramana in the early 1930’s and was struck by the power of his silence. Although Emmanuel first heard of Ramana Maharshi from an American whom he met in Kashmir, he subsequently real Paul Brunton’s book, and decided to make the pilgrimage to visit Ramana. Never before had I awared such integral Self-Radiance in any human form, such light of Silence. One was being fed just awaring him. At the first sight of him, I felt no excitement or even awe, no solemnity or ecstasy, simply a calm recognition, a glad contentment, and gratitude in his darshan. When Emmanuel first arrived, Ramana asked him his name and nationality, and inquired about mutual friends and his sadhana (the Way he had come). Emmanuel was put up in one of the ashram guest houses and during his two week stay spent many of his days sitting in the back of the meditation hall soaking in the quality of Ramana’s radiance. Unlike most of the other Westerners who came to visit the ashram, Emmanuel did not ask even one question; other than his response to those few initial questions from Ramana, there was no verbal communication between them. Emmanuel was therefore quite surprised when later heard from Paul Brunton that (soon after his departure) Ramana had referred to him as janam-siddha—“one of the rare-born mystics.” When Emmanuel heard this phrase “rare-born mystic,” he had no idea of what a “mystic” was or what it meant to be one who was “rare-born.” Emmanuel soon acquired a copy of The Oxford Book of English Mystical Verse in the hope of finding out what it meant to be a “mystic”; at the same time he began to examine his own childhood to see why he had been able to so easily loosen his identification with ego-consciousness. It was this exploration that was the origin of the reflections called Memory. We are always aware sunyata. What surprised him most in this message was the word “always”—although he had often transmuted Shakespeare’s phrase that “ripeness is all” into his own saying “awareness is all,” up to that moment he had never realized who he was is always “aware.” He also asked himself who is this “we”? Did it mean Ramana Maharshi and himself or did it include everone? Eventually he concluded that “we” is the indwelling, innerstanding Word, Logos, Sophia—the androgynous EmmanuEL. Another surprise was that Ramana, a Hindu sage, had used the Buddhis term “sunyata”, a term often translated as “the void” or “full solid emptiness”. The Buddhist doctrine of sunyata asserts that all beings and phenomena are free of any soul or intrinsic nature; this means that although people, things, and events appear on the outside to be real and substantial, they are actually—when innerstood—ephemeral and insubstantial. Sunyata took Ramana’s five words as recognition, initiation, mantra, and name. Thereafter, he referred to both himself and the hut in which he lived as “Sunyata”. Like a crystal that reflects many colors yet itself remains pure, clear, unaffected, that’s who he would always be, no-thing-ness. Tat twam asi, he was fond of saying—“ Thou art That”. During all these years in India, he was never employed, but found money being pushed on him. He was once offered 20 rupees a month ($2.50), but only accepted 5. Then in 1950, the Birla Foundation in New Delhi (shoes purpose is to assist saints and sadhus) asked him if he’d accept 100 rupees a month and he agreed to accept 20. “It was more than I needed at the time,” he admitted, “but I thought prices might rise.” It was later raised to 50 rupees where it remained for more than 20 years. Even after inflation made it hard to live on 50, Sunyata would never consider getting a raise through asking. Living nearby to his Himalayan hut on Crank’s Ridge were such neighbors as the Tibetan Buddhist scholars Lama Anagarika Govinda and Dr. Walter Y. Evans-Wentz. He would often make pilgrimages to the plains of India during the winter season, and return to his hut—high in the mountains—when the plains began to sizzle with the summer heat. He became personally acquainted with such leaders of the Indian independence movement as Mahatma Gandhi and Jawaharlal Nehru. He also came to know Anandamayi Ma and Neem Karoli Baba and many realized beings who are virtually unknown in the West. 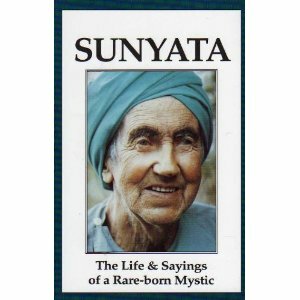 When he was invited to settle in America, Sunyata believed that his life was drawing to an end; here he was a man in his 80’s who had spent many of the last decades in silence. Over the years, however, he had developed a language to talk about his Reality and had discovered that there was an unusually good rapport with some of the spiritual seekers who had come from the West to visit India. “Prarabdha karma,” Sunyata once explained, “is the karma that cannot be changed in one’s lifetime.” So it was is prarabdha karma to first come to America at the tender young age of 84. One of the few places in America that had ever really interested him was — coincidentally — California. When he was a young man living in England, he had been exposed to the teachings of Theosophists who had spoken about a New Race of people being born in several geographical locations, one of which was supposed to be in California. If a New Race was being born, he wanted to be there for the birthing. So for the last six years of his life, he made his home in California. “I take my home with me wherever I go,” he said. He made no effort “to do” anything—his mode was simple “to be”. Many people claimed that significant changes in their life would occur after meeting him. “I do nothing, it just happens,” he would always say. While crossing a busy intersection in Fairfax, California on the morning of Sunday, August 5th, 1984, he was struck by a car. He was taken to nearby Ross Hospital, but by that evening he had entered into a coma. He lived another eight days, but never regained consciousness. I have heard this story about a mystic who had such experiences, but I never knew his name. I was pleased to read this, especially because there is a reference to a book about his life. Thank you! He came and stayed in my house in New Delhi.